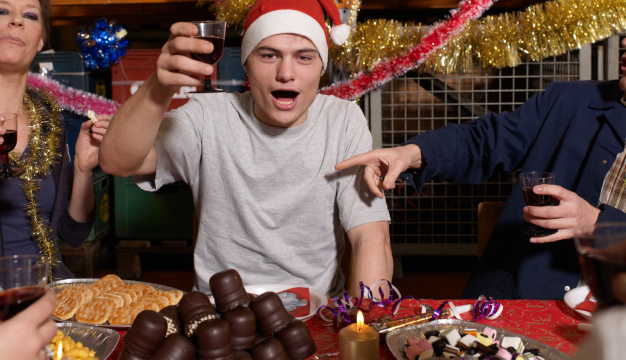 Here are some tips for making a good impression during a holiday party. Many entrepreneurs, particularly during the holiday season, attend parties with the intent to network, foster relationships, and climb a few notches on the entrepreneurial ladder. No matter what your goals are, it’s important to keep your manners in check or you could wind up with eggnog on your face. Here are some tips for making a good impression during your upcoming holiday party. 1. Eat something before the event. It’s wise to concentrate more on making connections than filling your stomach with food and alcohol. Too much liquid cheer can lead to regretful (and sometimes fatal) situations. 2. Avoid messy or difficult-to-eat foods. Choose hors d'oeuvres that can be eaten in one bite so you don’t accidentally get food on your clothes. Piling too much food on your plate is a faux pas. You don’t want to look like a glutton. It’s better to concentrate more on mingling than the meatballs. And don't talk with your mouth full of food. Break out of your comfort zone and introduce yourself to new people rather than sticking with only those you do know. Diversification is the hallmark of an investment portfolio. The same holds true in networking and relationship management. Meet people at different levels and occupations. Be open and friendly to everyone. The person you connect with today could end up being your best client or customer in the future. 5. Learn to remember names. When you’re introduced to someone, repeat his or her name immediately after hearing it. Use the name a couple of times in conversation. If you can't remember someone's name, say something like, "It's been one of those days. I know you’re Paul’s wife, but please tell me your name again." Or, extend your hand and say your name. This will prompt the other person to say her name, too. 6. Hold your glass in your left hand. This will allow you to keep your right hand free for handshaking. No one likes to shake a cold, wet, clammy hand. 7. Choose your guest carefully. The person you bring to the party will reflect either positively or negatively on you. Follow the dress code and make sure your guest does, too. Wear something that is festive, yet professional. 8. Keep the conversation positive. Though work topics are bound to come up, a holiday party is not the time to gossip or talk about company politics. Be sure to include spouses, partners and guests in the conversation. If someone brings up a hot-button issue that sparks controversy or disagreement, quietly take your leave while the negative person rains on his own parade. Attending a holiday party is the perfect opportunity to get to know others on a personal level. Don’t be a wallflower or spend a majority of the evening texting, talking on your cell phone, or posting photos on your social media pages. Put people first and your phone on silent. To be a good guest, all you need are some basic skills, an open mind, and most of all, a desire to make others feel important and appreciated.